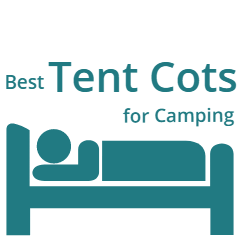 In this text you have the best collapsible camping chairs that are available on the market in 2019. All of them are top-notch items from renown brands. • Regarding the setup, the chairs presented here are from the group of collapsible chairs that need assembly. This makes them different from those that belong to folding chairs. But the assembly which you have here is always very simple – the frame is built from shock-corded aluminum tubes so they are all one single piece. This is a press-fit structure similar to the poles of a camping tent. So when you set up the frame in a few seconds, you simply add the sling above and that’s all. • Weight-wise, the list includes chairs above 2 pounds of weight. 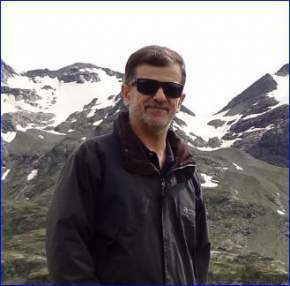 There is no particular reason for such a lower weight limit, I just wanted to present those that, although lightweight, are probably not backpacking tools, at least for ounce-counting backpackers. 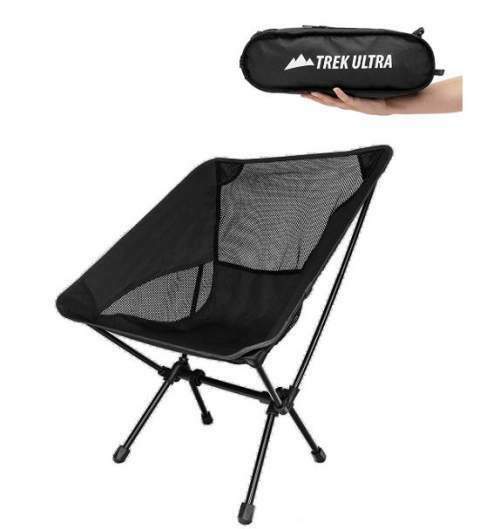 So if you need ultra lightweight chairs suitable for backpackers and hikers, please check this list. This list together with the one you have in the text here gives you plenty of options to choose from. But clearly, even those super-light backpacking chairs belong to the group of collapsible chairs that you have here. In some cases, there may be some difference in the comfort, a bit heavier chairs presented here are usually larger, with a higher back section, so they may be more comfortable than the tiny backpacking chairs. • Yet another difference with respect to those folding chairs, is that in most cases you do not have armrests, but there are exceptions. So in that sense, these collapsible chairs typically offer less comfort. Bear this in mind if this is important to you and if you plan to spend lots of time just sitting in the camp. So here is my list with chairs ordered alphabetically, so the numbers are just for navigation, there is no ranking here. 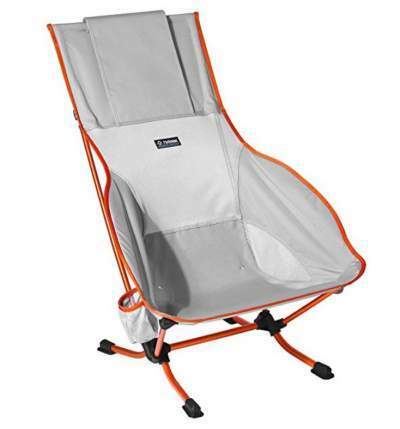 Alite Designs Stonefly Camping Chair. 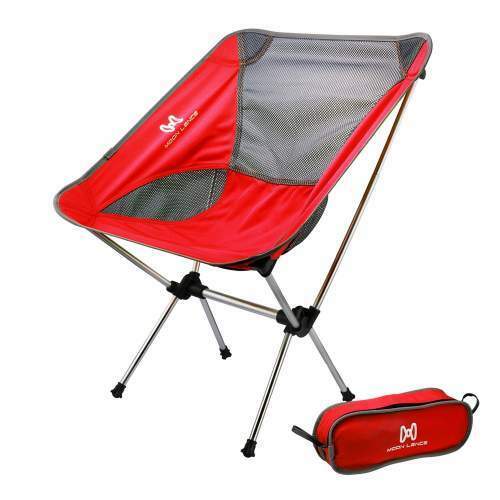 This Stonefly Camping Chair is a new item on the market, very lightweight, collapsible and nicely packable. It comes with some unique patented features that are unusual to find in the chairs of this type. These include cup holders and armrests. As you realize, the legs are in fact bars, so this is a good design which makes the chair suitable to use on any surface. It will not sink if used on a soft ground. The chair is fully collapsible and this is why it is in the list, and the weight is in the range which is above those ultra-lightweight backpacking chairs. So it weighs 2.75 lb (1.25 kg) and as you realize this is a very lightweight and backpack-portable chair. The capacity is impressive 330 lb (150 kg). The packed size is also very good. Please read more in my full review. This chair weighs 2.9 lb (1315 g), so this is still light enough to carry to some shorter hiking tours. As you realize from the picture, its back section is quite high so you have a great back support here. 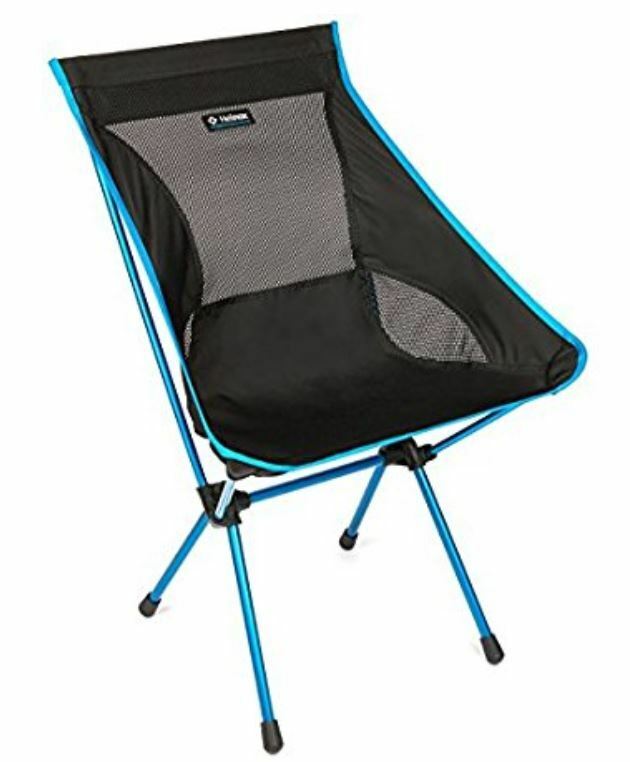 But see also its capacity, it is able to support the weight of up to 319 lb (145 kg), this is quite in the range of those much heavier steel folding camping chairs. Yet here you have just aluminum frame but this is of the best quality. The packed size is reasonable, you have it nicely packed in its carry bag which is only around 19.7 x 5.5 x 4.5 inches (50 x 14 x 11.5 cm). So you can transport it even on a bicycle. Please follow the link to see more. This Chair One XL is an enlarged version of the award-winning Helinox Chair One hence the letters XL in the name. 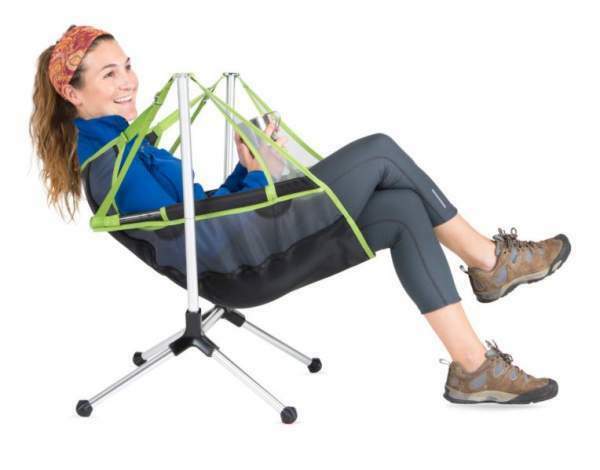 So naturally, it does not fit in my list of ultralight backpacking chairs. 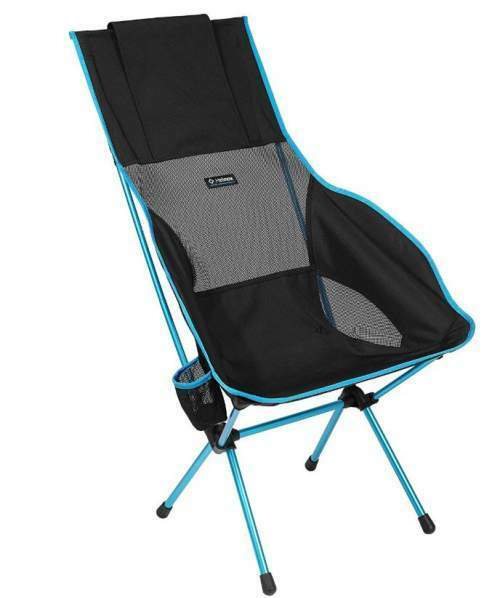 But this is an excellent collapsible camping chair which is still backpack-portable. They have used very advanced materials here. So the frame is a durable DAC aluminum, a special type TH72M aluminum alloy, and the connectors are a high-strength nylon 66. The chair weighs 3.52 lb (1610 g) and its packed size is very good, 18.5 x 5.1 x 4.7 in (47 x 13 x 12 cm). The seat is 18.5 inches (47 cm) above the ground. Please follow the link for more details. It is obvious from the name what the best feature of this chair is. So indeed it has two rails which you attach and you have a great rocking chair in the camp. You realize also that these rails may play a big role if you have to use the chair on a very soft ground. It will not sink with something like this, but it will not be a rocker in such a situation. But apart from this, the chair is very tall so you have a great back and head support. The weight is 4.1 lb (1.85 kg), so this is only for camping. But you do not have to use the rails and can leave them at home, it will be considerably lighter, just to know. The capacity is also great, it supports up to 320 lb (145 kg). Please follow the link for more. This Playa Chair has a very low gravity center when you sit in it, the seat is only 11 inches (28 cm) from the ground. The backrest is very high and it offers a great headrest, you have some extra padding in the head area. There are soft armrests as well so this is a very comfortable option for outdoor relaxing. The frame is all one piece with shock-corded elements and this is the best of the best DAC stuff. The chair weighs 4 lb 3 oz (1900 g) and the capacity is very good 320 lb (145 kg). It comes with a nice carry bag so you can transport it attached to a backpack. This Savanna chair is a new item on the market, and the most important feature is its high backrest and the headrest. This is one of the tallest chairs here in the list, no less than 44 inches (114 cm) from the ground. Note that the seat is 17.5 inches (44 cm) high. So this tells you that it offers a great headrest. The chair weighs 4.3 lb (1.95 kg) and it is not so great to be carried attached to a backpack, but you can transport it on a bicycle. The capacity is great, 320 lb (145 kg). Note that you have two cup holders and a nice carry bag. Observe that they give 5 years warranty for this chair. This Sunset Chair is very similar to the Camp Chair from the same brand shown above. But the most important difference is the back length. This is a tall chair with a great back support, it is 38.6 inches (98 cm) tall. The weight is excellent, 3.25 lb (1475 g), and the packed size is also very good, 18.5 x 5.5 x 4.7 in (47 x 14 x 12 cm). So the chair is backpack-portable although not an ultra-lightweight item. You have top quality materials here, but it comes at a price. Please follow the link to read more. 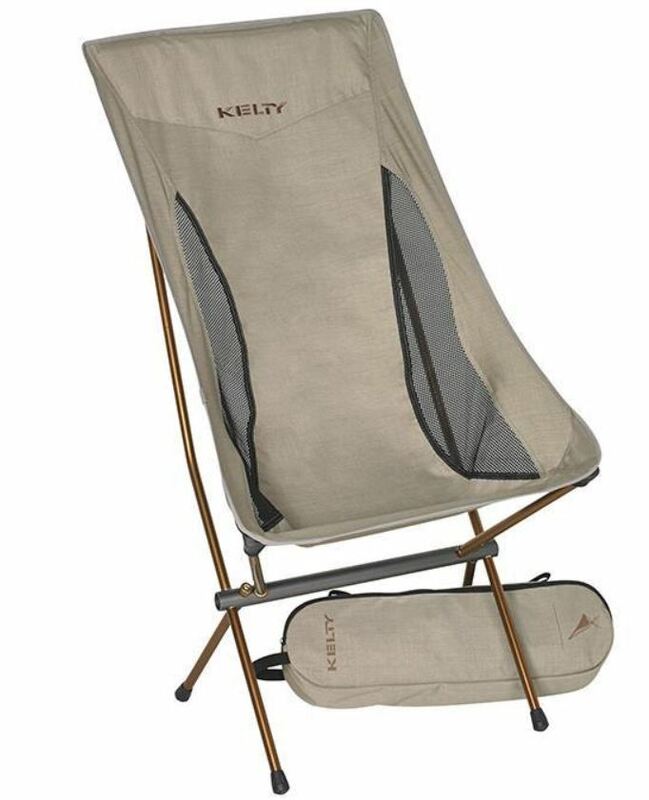 Kelty Linger High Back Chair. You see already from the title what the best side of this chair is – it is exceptionally tall and you have an excellent back and head support. It goes up to 39 inches (99 cm). The other dimensions are also great. So this chair is built for comfort in the camp. When packed, it collapses to 20 x 6.5 x 4 inches (51 x 17 x 10 cm). So you can indeed transport it even on a motorbike and on a bicycle. The weight is 3 lb 6 oz (1.5 kg), and it supports the weight of up to 300 lb (136 kg). This chair is in between the backpacking and camping chairs. With the weight of 2.07 pounds (940 g) it may be light enough for some people to carry it attached to the backpack. Its packed size is definitely such that this is possible, the packed dimensions are 13 x 5.5 x 5.5 inches (33 x 14 x 14 cm). 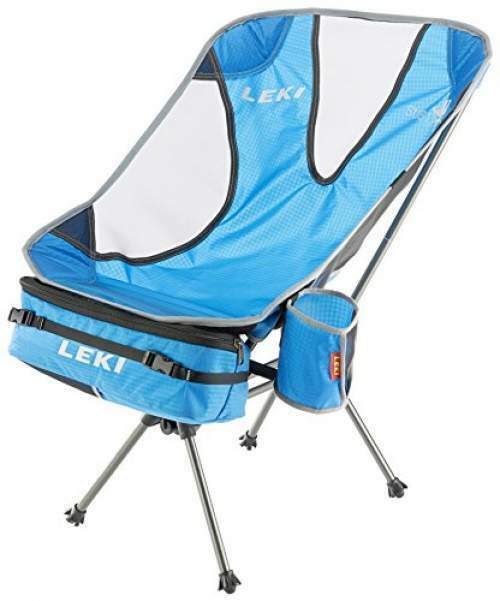 The LEKI Sub 1 Chair comes with a bonus cup holder, and its carry bag is designed so that you can attach it to the chair and use as a storage pouch, you see this in the picture. Please read more in my full review. 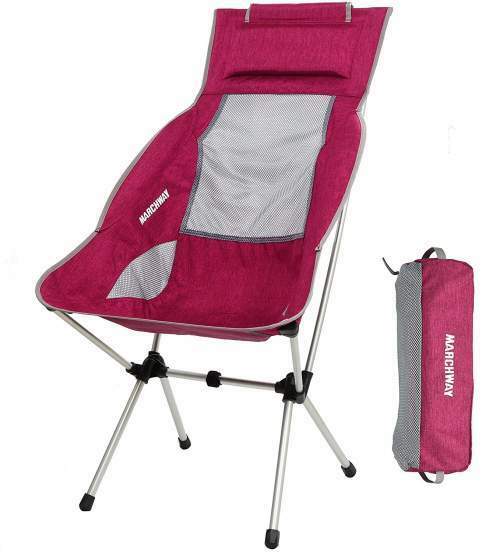 MARCHWAY Lightweight Folding High Back Camping Chair with Headrest. This is a fully collapsible chair with several remarkable features. You see them already in the name: the high back and the headrest. Note that the headrest comes with an integrated bar which remains there even after you take the chair down. 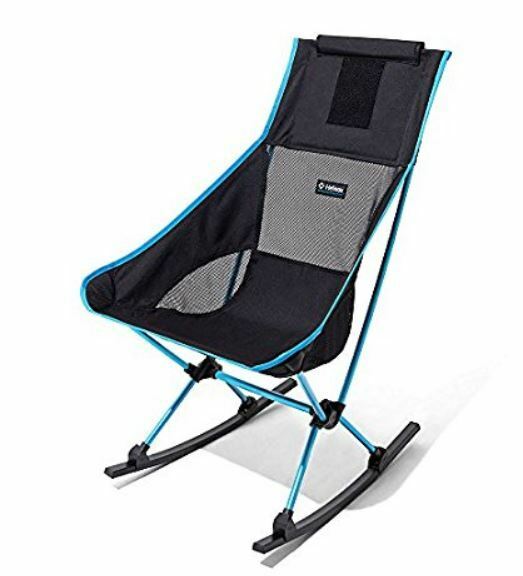 The weight is 3.7 lb (1.68 kg) so this is a backpack portable chair for shorter trips, but I see it more appropriate for camping and for many other activities. It packs to 17 x 6.6 x 5.5 inches (43 x 17 x 14 cm). The frame is a very durable aluminum and the capacity is 300 lb (136 kg). Yes, it is built in several different and nice colors to choose from. Please follow the link for more. Note that in the title I use the name as it is displayed by the manufacturer. With the weight of 2 lb (907 g), this chair could indeed be called ultra lightweight, but there are lighter options on the market. This chair supports the weight of up to 242 lb (110 kg), its packed size is really good, it reduces down to 14 x 5 x 3.5 inches (36 x 13 x 9 cm). So it is in between the true backpacking and camping chairs, and this is what makes it so versatile. The frame is aluminum of course, all pieces are shock-corded. The setup is simple and easy. Please see more in my full review. This Stargaze Recliner Chair is unlike any other chair on the market, a totally unique design. 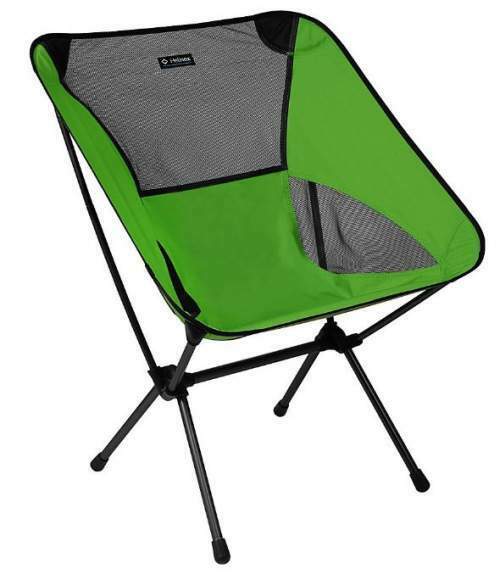 Obviously, it is a collapsible chair and this is why it is in the list here. But as you see from the title, this is also a recliner chair with an automatic backrest adjustment system. But this is not all. What you have here is a swing chair which is supported by the two side poles. Also very unusual for a collapsible chair is that you have solid and padded armrests. The chair packs nicely and it is backpack-portable. It weighs only 5 lb 11 oz (2.59 kg) and the capacity is 300 lb (136 kg). Note that they also have a Luxury Recliner Chair in this series, with a headrest. Please follow the link for more. This chair is very lightweight and portable as the name suggests, and it weighs only 2.6 lb (1.18 kg). It comes in a nicely designed carry bag with straps and with webbing loops, and the dimensions when packed are excellent 14.5 x 5.5 x 4 inches (37 x 14 x 10 cm). From all this, you realize that you can transport this chair in various ways and this makes it very versatile. The capacity is also excellent, 350 lb (159 kg). Note that it comes with two sets of feet and one set is extra large to use on a soft ground. The aluminum frame follows the same logic as in all chairs here, so all the tubes are shock-corded and the setup is very easy and simple. 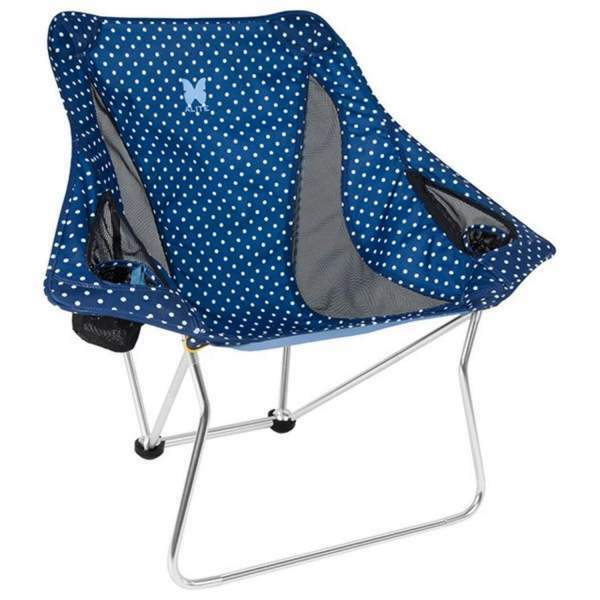 So this was my list of the best collapsible camping chairs currently available on the market. As mentioned above, this list can be extended to include also the ultralight backpacking chairs, those are all good for camping as well. The list presented here will be updated regularly so bookmark this page and check for new models that will be added in the future. 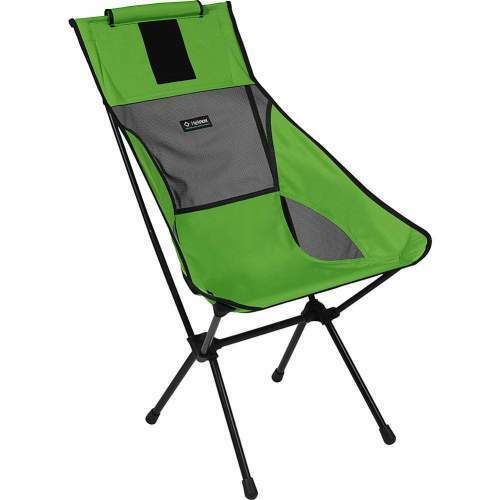 If you need larger and stronger chairs for camping, check the list with folding chairs. Thank you for reading. Please use the comment box below in the case of questions or comments.